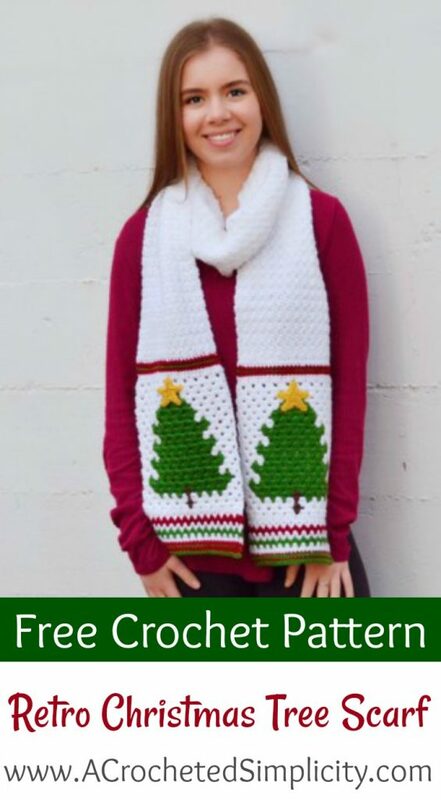 The Retro Christmas Tree Scarf is fun to make, fun to wear, festive for this time of year, and very warm! For this scarf I chose Lion Brand Yarn’s Vanna’s Choice as this line has a large selection of colors and I was able to find every color I was looking for. Vanna’s Choice yarn is a medium worsted weight acrylic yarn that has a nice sheen to it and is soft enough for accessories worn close to the skin. I tend to crochet on the tighter side, if you crochet more loosely, you may need to go down a hook size or two to meet gauge. 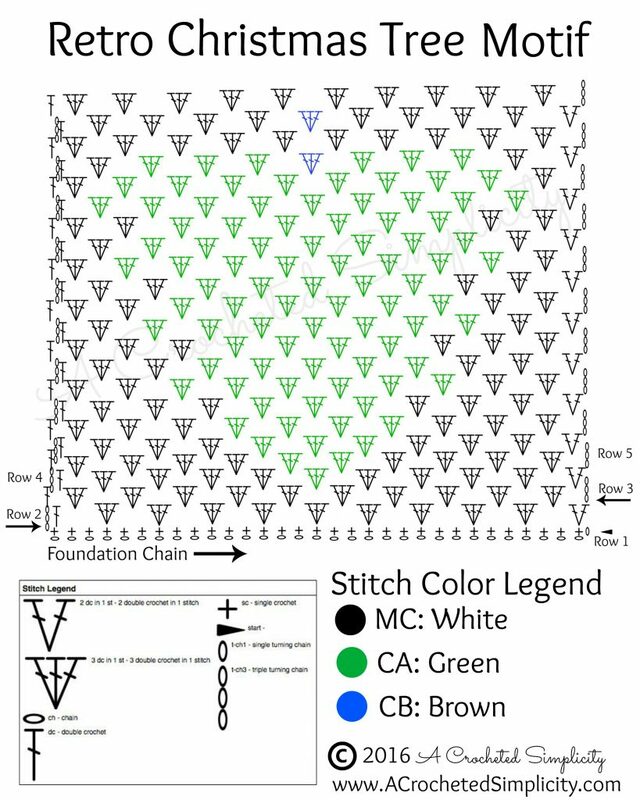 Beginning ch 3 in motif are counted as a stitch and included in stitch count. Beginning chains in the rest of the scarf are not included in stitch count, unless stated otherwise. Color Changes: Work all color changes on the final pull thru of the last stitch you’re working before the new color. Example: If the last st you’re working before a color change is a double crochet, begin your double crochet by inserting your hook where indicated, yo, pull up a loop, yo, pull thru 2 loops, yo with the NEW color, pull thru remaining 2 loops to complete the stitch. Then continue on with your new color. *Click here for Change Photo Tutorial. Other medium worsted weight / 4 yarns can be substituted. Make sure to work all color changes on the WS of the motif. Carry yarn when working the motif, but do not pull yarn floats tight or your gauge will be greatly affected. See Color Change Photo Tutorial for tips! The motif is worked from the white just above the top of the tree to the bottom of the trim. Then you will work the scarf section onto the top of one tree motif, then seam to the top of the other. Alternate Ch-3 (alt-ch3): Complete last st of previous row, take loop off hook, insert hook into the space between the last dc and last 3 dc of previous row, put loop back on hook and pull thru space, turn, ch 3. *Click here for photo tutorial. 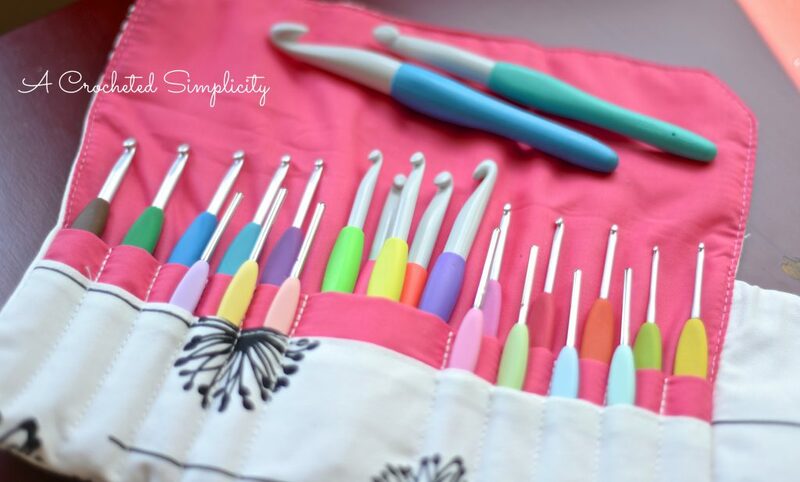 If you’re looking for a great new crochet hook case, click here to check out this one from our affiliates! *Place a SM in the 1st st of Row 1 (before turning). *Follow color chart below beginning w/ Row 4. Rows 5 – 23: Rep Rows 3 – 4, ending with a Row 3 rep.
Do not fasten off. Continue below to Ric Rac Trim. Row 2 (CC): Ch 3, [ 2 dc in sp of next 2-dc cluster from the previous row ] 15 times, dc in top of ch-3. Turn. Row 3 (MC): Rep Row 2. Row 4 (CA): Rep Row 2. Row 5 (MC): Rep Row 2. Row 7 (CA): Rep Row 6. Row 8 (CC): Rep Row 6. Row 9 (CA): Rep Row 6. Fasten off. Weave in ends. Make 2nd Tree Motif then continue below to Scarf Section. Note: This section is worked on one of the tree motifs only. You can remove the SM from the other motif and set it aside until this section is complete. Row 2 (RS) (MC): Ch 1, sc in each st across. Turn. Row 3 (CC): Ch 1, sc in each st across. Turn. Row 4 (CA): Ch 1, sc in each st across. Turn. Row 5 (CC): Ch 1, sc in each st across. Turn. Row 7 (MC): Ch 1, [sc in the next st, dc in the next st] rep from [ to ] across. Turn. Rep Row 7 until you have approximately 16″ of MC remaining (scarf section should measure a little over 55″, not including tree motif). 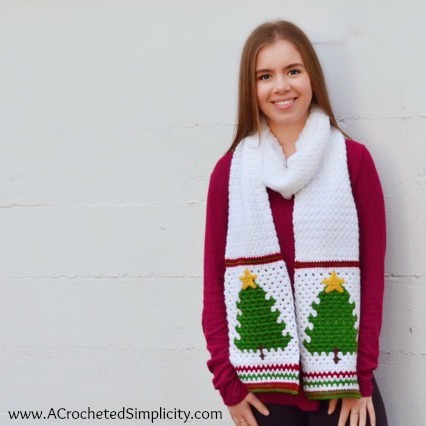 Using a yarn needle and 16″ tail of yarn, whipstitch the last row of the scarf section to the top of your 2nd tree motif. Weave in ends. Continue on to Star, if desired. Fasten off leaving an 8″ tail for sewing. Sew the last point down onto Rnd 1. (You may prefer to sl st it down like the previous 4 points, but I’ve found that it leaves less of a noticeable hump if I sew the last point in place.) Weave in ends. Continue below to Finishing. If you’ve made stars, using a yarn needle and tail of yarn, sew them onto your scarf near the top of each Christmas tree. Weave in ends. 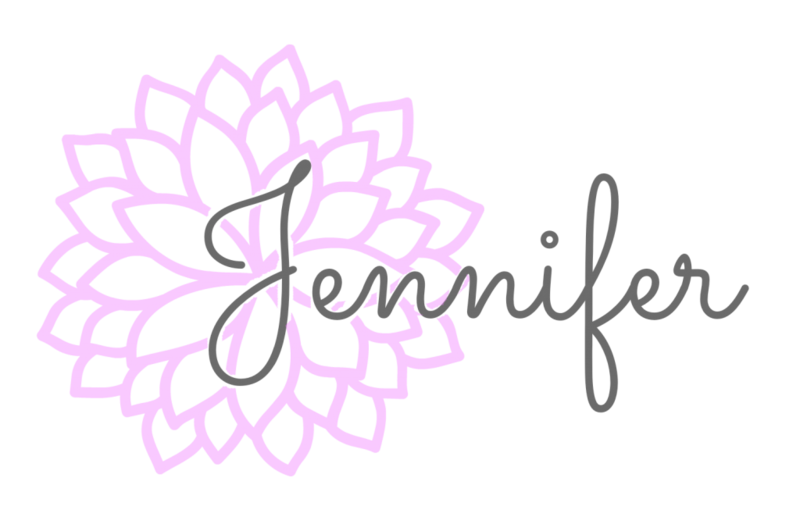 I really hope you’ve enjoyed this free crochet pattern & you’ve learned a new technique or two to add to your crochet toolbox! 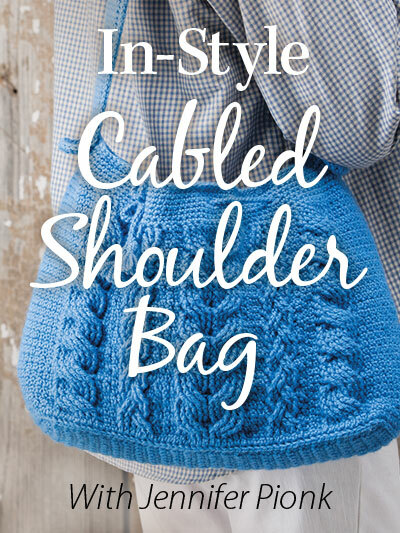 If you loved these techniques, check out my Ravelry shop for more great designs (such as the “Boho Chic” Mosaic Tote Bag below) to practice your new skills on! 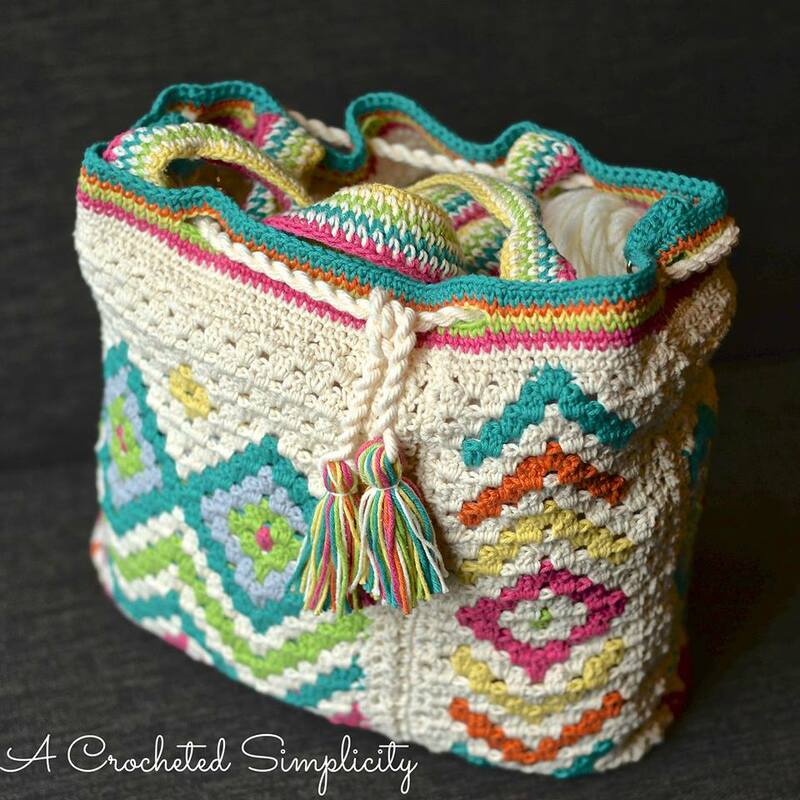 Please share your finished ACS projects with us in the A Crocheted Simplicity Crochet Community Group on Facebook!